At just 5cm long and 2g in weight the smallest bird in the world is none other than the Bee Hummingbird. Found mainly in Cuba and also holding the record for the smallest egg in the world these guys are tiny. 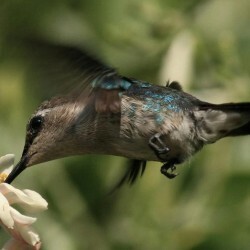 Like all hummingbirds they can fly not only forwards but also backwards, up, down and even just hover. Their small size and amazing flying skills mean they’re experts at moving from flower to flower collecting nectar and even small insects. In fact they’re so good at flying (some visiting as many as 1500 flowers a day) that they don’t even walk anymore and only use their feet for perching. Now in order to maintain such flying control there’s one skill we haven’t touched upon yet, and that’s their ability to beat their wings at up to 80 times per second. That’s so fast that humans can only see the wings moving as a faint blur. Now that’s quick! Also Check out... What Birds Can Fly Backwards?